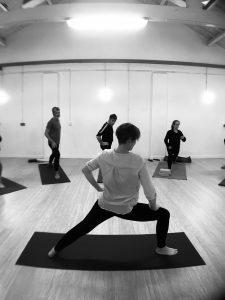 I have been running a regular class for cyclists, focussing particularly on steadying and expanding the breath, opening the hips, hamstrings and shoulders and strengthening the core and inner thighs. As a whole range of people have been coming to this class, most often seeking stretching, strengthening and release in relation to some kind of sporting activity, I thought I’d expand the class to include runners, climbers, canoeists, walkers etc. This class is suitable for beginners or for those of you with more experience as you will be invited to engage with the sequences according to your own ability and energy on the day. My aim is for you to feel fully open and relaxed by the end of the class. The classes will run at 7.30 – 8.45pm on Monday nights.